It’s always a distinct honor when a client places their trust in me as a psychic medium. Every reading and client (incarnate and discarnate) is dear to my heart. But there are some mediumship sessions that leave me gaping at the wonder of the whole metaphysical world – and humbled. Truly humbled. The story of Hope, her twin sister Faith, and the proof they showed me of how love never dies is one such reading. Before we begin, I want to thank Hope for granting me permission to share her incredible story with the world. My office is in Gainesville, Florida. It’s a college town. Go Gators! So, I see tons of young adults who’ve never had a psychic reading. I LOVE them! They’re always so excited – and nervous. Their auric energy field lights up my office like Halloween and Christmas combined! On this particular day, at the office door stood the most darling little sprite of a girl. Shiny brown hair, eyes as big as the moon, and a smile like a fairy princess. She was so luminous she didn’t look real. And, dig this – her name is Hope. Does one college kid get any more precious than that? Hope and I exchanged the prerequisite pleasantries and whammo. Incoming! A spirit showed up pretty as you please. This wasn’t just any spirit, this one was quite powerful and clearly very experienced at navigating on the other side. “Hope, honey”, I gently asked. “Have you lost a sibling”? Now, those who’ve had a psychic medium reading with me (or tarot reading) know that I ask clients not to share any information other than answering yes or no. This way, we can both be certain they receive a real psychic medium reading – not an advice or coaching session. But before I could stop her, Hope burst out, “My twin sister died before we were born and I’ve always like a part of me is missing”. Well, sweet Hope was already a jittery because this was her first reading. Add in that her first message was a spirit communication from the other side and I had to hand her a box of Puffs Tissues. As often happens in my office, tears started to flow. Hope’s twin delivered many specific messages. One of the best was that Hope loves animals and really wants to be a Veterinarian. Sis greatly encouraged her to continue in school so she could help as many animals as she can. At the end of Hope’s reading, she asked how the tarot cards work. 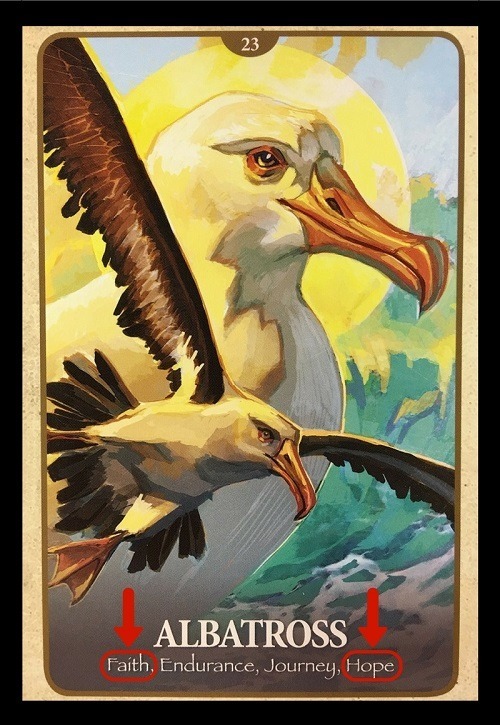 I replied, “Here, I’ll show you.” and reached for one of my favorite spirit animal oracle card decks – The Secret Language of Animals by Chip Richards & Jimmy Manton. Hope leaned forward to look closely at the card and subsequently turned white as a sheet – OK, ghost. Sorry. I just had to say it because that kid turned SO white she was all but transparent. I was stunned. I was moved. I was so grateful on behalf of Hope and, if she chose to tell her about the reading, their mom. Slack-jawed and shocked we just stared at each other. Yeah. I know. I’m supposed to be more professional but I’m human, too and this was just an over-the-top psychic experience. The irrefutable evidence of life after death – of love after death was overwhelming and beautiful. Once we were able to talk, we hugged and said our goodbyes. It’s not the first or even three thousandth time the right card with the right message has literally come flying out of a tarot or oracle deck I was shuffling. But, with names? Two names? Of twin sisters? Mind. Blown. Much of psychic medium experiences can be explained by way of science – at least what we know of science today. But I’ve never been able to figure out how it is that the ‘right’ tarot and oracle cards always seem to show up at the precise moment for the exact person. Because of this incredible experience, I asked my mediumship guru – the legendary platform medium, Arthur Findlay College teacher, and spiritualist Mavis Pittilla. Mavis explained her opinion is that discarnates (spirits) use telekinesis – much like when the penny slides up the door in the movie “Ghost”. I suspect the vast majority of humans have had ‘strange synchronicity’ like this happen. We’re praying or talking to a loved one on the other side and ‘randomly’ ‘their’ song starts to play on the radio or the lights flicker or the TV turns on by itself, etc. Some spirits love and miss us to such an extent they physically reach out from beyond the veil. While that might seem like pure ridiculousness, if anyone has a better explanation I’d love to hear it. For now, I trust and believe in the spirits. It’s only fair, you know. After all, I ask them to trust and believe in me.